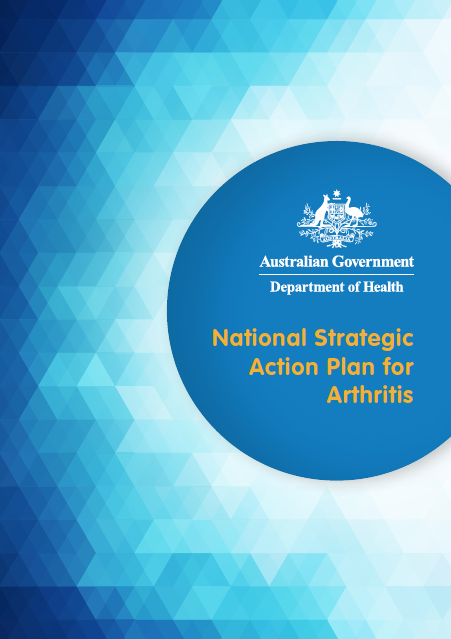 The National Strategic Action Plan for Arthritis provides an evidence-informed blueprint to guide national efforts to improve health-related quality of life for people living with arthritis. Implementing the Plan will help to reduce the cost and prevalence of the arthritis and reduce its impact on individuals, their carers and the community. Arthritis is one of the most common, costly and disabling of all chronic conditions. Nearly four million Australians of all ages, including children and young people, live with arthritis. Yet the personal, social and economic impact of arthritis is poorly recognised and often wrongly trivialised. We can do much to prevent and better manage arthritis to reduce the severity of the condition and its impact on individuals, carers and families, health and welfare systems, and the economy. The Action Plan identifies three key priority areas and a range of actions to achieve the overall vision of freedom from the burden of arthritis. Stakeholders across all sectors of the health system will need to work together to implement the Action Plan.